The October flower is Marigold. They were first discovered in the 16th century by the Portuguese in Central America who then introduced the flower to parts of Europe and India. In Aztec culture the marigold was believed to have magical religious and medicinal properties, which date back to 1552 when herbal records show they were used to cure hiccups and anyone injured from being struck by lightning. A magical use of the flower was when it was used to protect sailors who carried it for safe passage over rivers and other bodies of water. In ancient South Asia marigolds were popular and held great value. The bright golden colour of the flower resembled that of honourable people known as Ayra. The flower was so valuable that it was used as a decoration at various places of importance to the people of that day. As a result, it was common to find them lining ceremonial rooms and pavilions. Early Spanish explorers were said to have taken marigold seeds from the Aztecs in Spain, where they were grown in monastery gardens. From there marigold seed went to France and Africa. 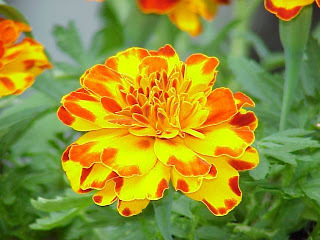 In Mexico marigolds are also used as a decorative flower and are popular during All Saints Day and All Souls Day. They are also used in Hindu religious ceremonies. Marigolds were also made into garlands to decorate during harvest festivals and other items similar in colour, such as corn and peppers, were used in the ceremonial decorations. The marigold is an everyday sight in modern day India where they continue to be used as a decorative plant. They are are used in various ceremonies from weddings to funerals and are used as offerings to gods, dried into a powder they are rubbed onto the exterior of village homes and oils extracted from the flower are used for the creation of numerous perfumes. Marigolds did not arrive in North America until the time after the Revolutionary War. In the early 1900’s both the sweet pea and marigold were gaining popularity in the United States. It was in the 1920’s when breeding led to the introduction of hundreds of new varieties. 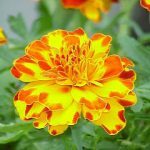 Some of the new developed marigolds introduced at the time included the white marigold, the odourless marigold as well as hybrids and triploids. Marigolds are still commonly used as a medicinal herb. The flower is said to remedy the swelling of a wasp or bee sting when rubbed on the affected area. A lotion created from the flower is considered useful for sprains and wounds and inflamed eyes are said to benefit from water distilled from marigolds. Other medicinal qualities come from eating the leaves of the plant in a salad. They are believed to be useful in scrofula of children and the plant’s acridness has made it a choice for the treatment of warts. The word marigold is used to describe plants with golden yellow blossoms and the Calendula (marigold) symbolizes sorrow or sympathy, which explains the hidden message “My Thoughts Are With You”, associated with this flower. Want to know more information about Maarigolds?